Place the zucchini and the tomatoes in a mixing bowl and sprinkle the salt over the mixture. Let the vegetables sit for 15 minutes. The salt will extract the juice of the vegetables. This liquid will be used to create the sauce. After 15 minutes or so, add the garlic, the lemon juice, the vinegar, and the olive oil and mix everything thoroughly. In the meantime, cook the orzo in a pot of salted, boiling water according to the package instructions. Drain the orzo well in a colander. 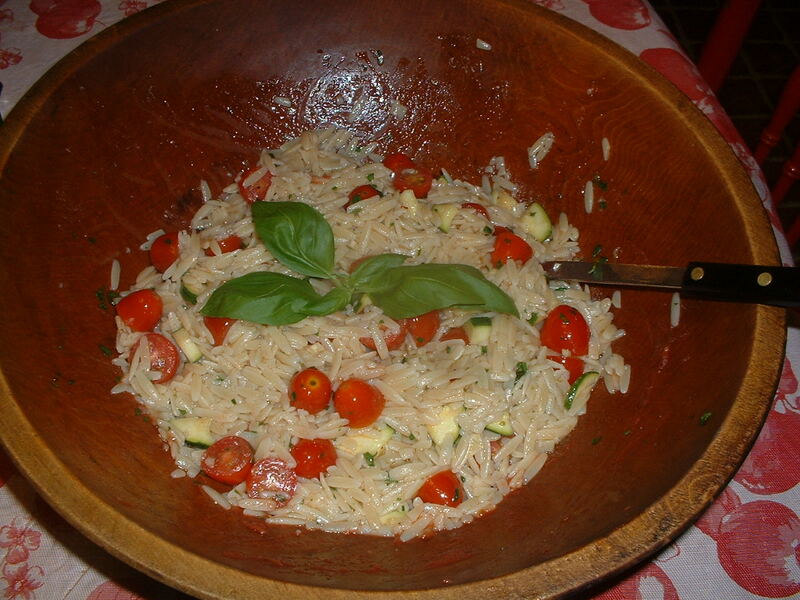 While the orzo is still hot, add it to the vegetable mixture and mix well. Add the parsley, the basil, and the crushed red pepper flakes. You can serve the dish warm or at room temperature. You can add toasted pine nuts, kalamata olives, and/or crumbled feta cheese, if desired. This traditional Caesar salad dressing uses four egg yolks. In a large salad bowl, mash the garlic, the sea salt, and the black pepper with a fork to form a paste. Add the anchovy paste and mash again. Add the mustard, the Worcestershire sauce, and the grated cheese. Mix well. Add the lemon juice and the red wine vinegar. Whisk the mixture well. While continuing to whisk, slowly drizzle in the olive oil. Add the egg yolks. Whisk well until the dressing takes on the consistency of mayonnaise. 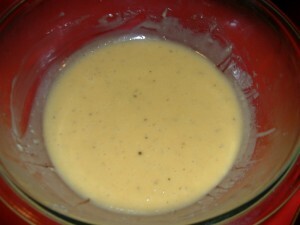 Cover and refrigerate the dressing for at least 2-3 hours. 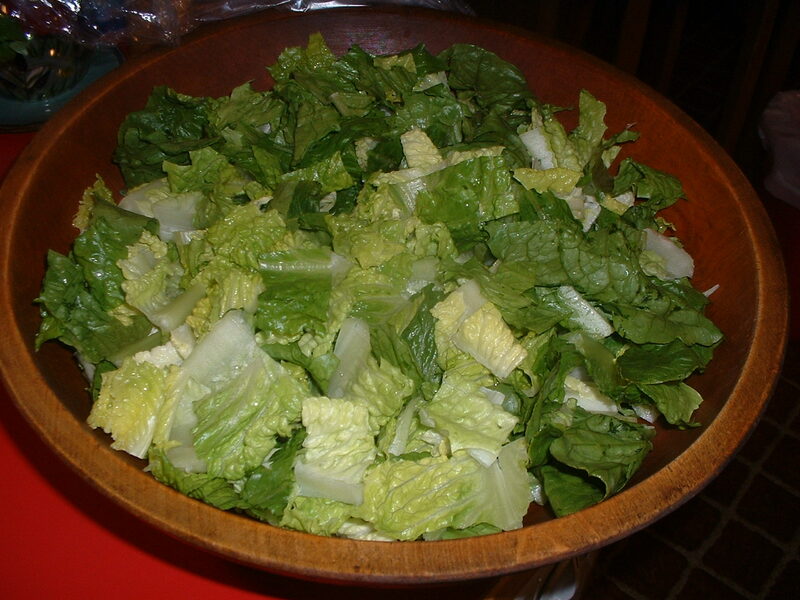 When you are ready to serve, add the lettuce to the salad bowl. Toss well. Garnish with the croutons and more grated cheese (if desired). My wife, Connie, recently made this tasty, easy-to-prepare dip. It was a big hit at a Memorial Day party. Combine all of the ingredients in a bowl. Mix well. Bake in a preheated oven set at 375 degrees for 15 minutes. Cook’s Note: When making a dish of this nature, make sure that all of your ingredients are chopped and measured before you start cooking. Into a 12-14 inch non-stick skillet, add the canola oil and a tablespoon of sesame oil. Heat the pan for three minutes on medium high heat. Add the shrimp. Cook the shrimp for three minutes until they turn pink. Turn off the heat. Remove the shrimp to a plate. Add the mushrooms to the skillet and turn the heat up to medium high. Cook the mushrooms for two minutes. Add the broccoli florets and cook for an additional two minutes. Add the soy sauce, the shrimp stock, the garlic, the scallions, the ginger, and the sriracha sauce. Stir the ingredients well. 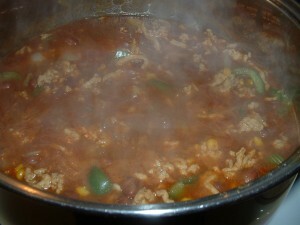 Turn the heat down to low and simmer the mixture for 10 minutes. Add the shrimp back to the pan along with the peas for the last three minutes of cooking time. In the meantime, cook the linguine in a pot of salted, boiling water for about 5 minutes. The strands of linguine will begin to float to the top when they are cooked. Drain the pasta well in a colander. Toss the linguine with a tablespoon of sesame oil. 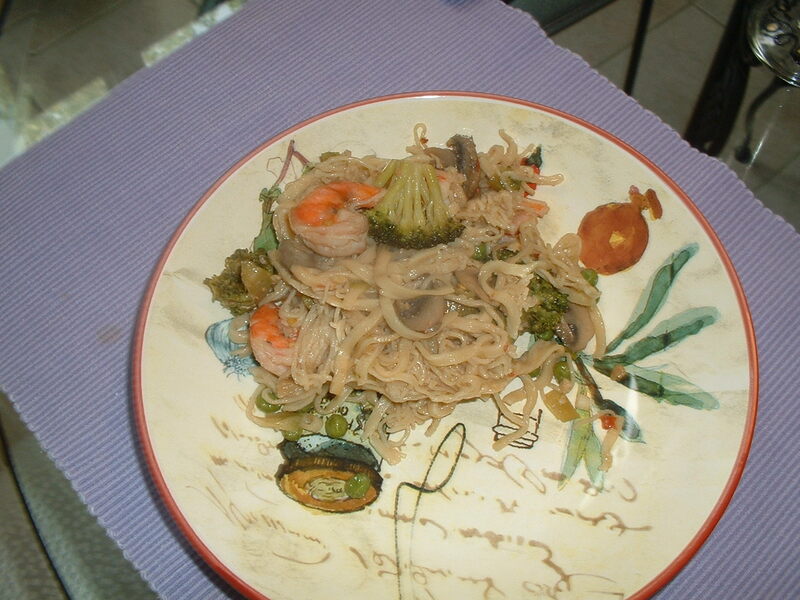 Add the cooked linguine to the skillet with the shrimp and the vegetables. Cook on low heat while stirring for two minutes. Turn off the heat. Garnish with the chopped peanuts and the sesame seeds before serving. Place the chicken breasts and the sausage on a sheet pan. Sprinkle the chicken breasts with sea salt and ground black pepper. Roast in the preheated oven for 1 and 1/2 hours. Remove and let the meat cool. Into a Dutch oven, add the olive oil, the oregano, a teaspoon of sea salt, 1/4 teaspoon of black pepper, the onion, and the garlic. Cook on medium high heat stirring frequently for two minutes. Add the red wine. Let the wine cook and reduce for three minutes. Add the tomato paste. Cook for one minute while stirring. Add the crushed tomatoes, the red bell peppers, and the hot cherry peppers. Stir again. Add the rosemary, the basil and the parsley. Bring the mixture to a slight boil. 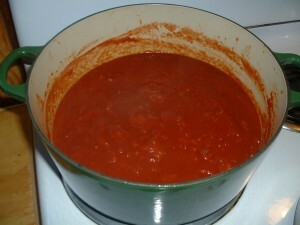 Turn the heat down to low and simmer the sauce stirring occasionally for 1 and 1/2 hours. 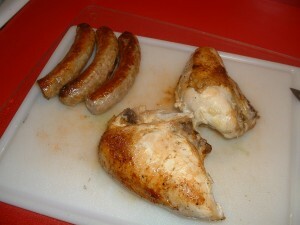 Remove the white chicken meat from the bones and chop it into about one inch pieces. Chop the sausage into about 1/4 inch disks. Combine the ricotta cheese and the grated cheese in a bowl. Add a sprinkle of sea salt and ground black pepper. 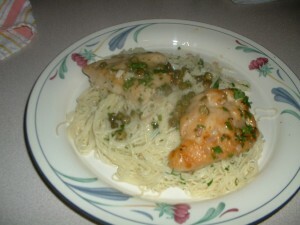 Note: If you like, you can add some chopped herbs such as basil or Italian parsley. Mix well. Set the ricotta cheese mixture aside. Cook the rigatoni in a pot of salted, boiling water according to the package instructions. Drain the pasta well in a colander. Remove the rosemary, basil, and parsley stalks from the sauce. Taste the sauce and add more sea salt and/or ground black pepper, if desired. Turn off the heat. Add the rigatoni, the chicken, and the sausage to the pot. Mix well so that the pasta gets coated with the sauce. 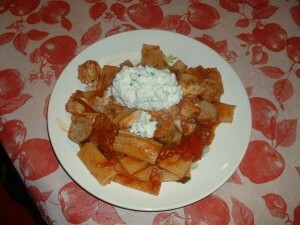 Serve with the ricotta cheese mixture (on the side). Clean out your freezer and pantry when you make this delicious chili. You can use black beans, pinto beans, kidney beans, or any combination of these legumes. Into a Dutch oven, add the canola oil. Put the pot on medium high heat for two minutes. Add the ground meat, the sea salt, the the red cayenne pepper. Cook while stirring frequently until the meat is browned. Add the onion, the green bell pepper, the celery, and the garlic. Cook for four minutes while stirring frequently. Add the tomato sauce, the water, the cumin, the chili powder, the cinnamon, and the oregano. Stir the mixture well. Add the beans and the corn. Bring the mixture to a slight boil and then turn the heat down to low. Simmer uncovered stirring occasionally for 30 minutes. After 30 minutes, taste the chili and add more sea salt and/or red cayenne pepper, if needed. Add the chocolate. Simmer for an additional five minutes stirring frequently to incorporate the chocolate as it is melting. Turn off the heat and cover to keep the chili warm or transfer it to a crock pot if you need to keep the chili warm for a long period of time. Serve with sour cream and chopped scallions. Into a large food storage bag, add the chicken, the flour, 1/2 teaspoon of sea salt, and 1/4 teaspoon of ground black pepper. Close the top and shake the bag so that the chicken gets coated evenly with the flour, the sea salt, and the pepper. Into a 12-14 inch non-stick skillet, add the olive oil. Put the pan on medium high heat for three minutes until the olive oil begins to smoke slightly. Add the chicken cutlets to the pan. Cook the chicken for four minutes on each side until the cutlets are lightly browned. Turn the heat off and remove the chicken to a plate. Retain the pan drippings. Add the shallot, the garlic, 1/2 teaspoon of sea salt, and 1/4 teaspoon of ground black pepper to the pan that the chicken was cooked in. Turn the heat up to medium high. Cook for one minute while stirring. Add the white wine. Stir and scrape the bottom of the saute pan to loosen all of the brown bits that have accumulated. Let the mixture cook for four minutes to reduce the wine. Add the capers, the lemon juice, and the chicken stock. Stir and cook for three minutes. Taste and add more sea salt and/or ground black pepper, if desired. Add the chicken (along with the juices in the plate) back to the saute pan. Reduce the heat to low and simmer for 7-10 minutes until the sauce reduces by a third. Turn off the heat. Add the butter and stir gently so that the butter gets well incorporated into the sauce. Garnish with the fresh parsley. Serve with rice, orzo, or angel hair pasta. Into a large pot, add about an inch of cold water and two teaspoons of sea salt. Bring the water to a boil. Add the basil leaves and the spinach leaves. Cook until the leaves have wilted (about two minutes). Drain the spinach and basil leaves in a colander. Squeeze out as much water as possible. Place the pizza shells in the aluminum pizza pans. Brush the pizza shells uniformly with the olive oil. 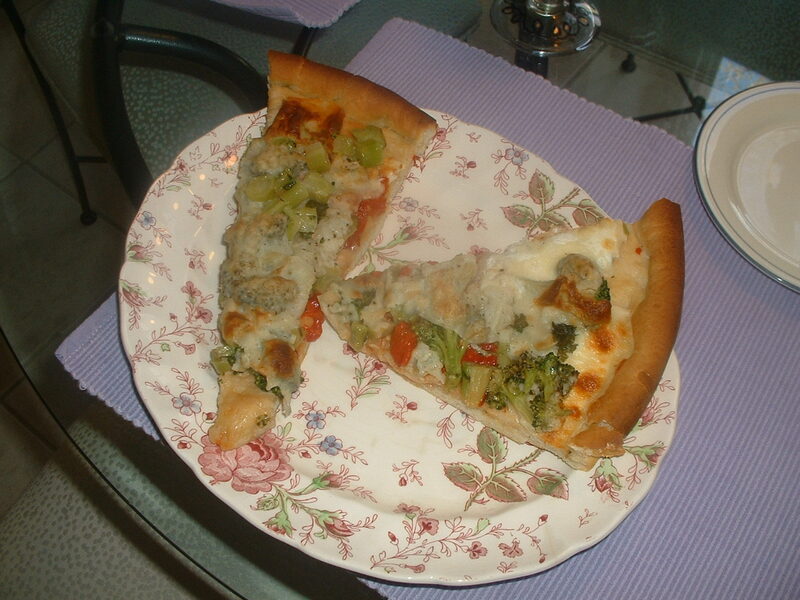 Sprinkle the pizza shells evenly with a teaspoon of sea salt and the crushed red pepper flakes. Spread out an equal amount of the minced garlic on each pizza. 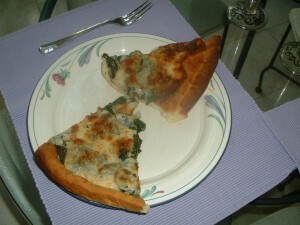 Place the cooked spinach and the cooked basil leaves evenly on each pizza. Squeeze the lemon juice on the spinach. Add the mozzarella cheese on top of the spinach (eight slices per pie). Sprinkle the ground black pepper evenly on top of the cheese. Bake in the preheated oven for 10-15 minutes until the cheese is bubbly and slightly brown. Let the pizza pies cool for ten minutes before them cutting into slices. Place the shrimp on metal grilling skewers. Brush both the shrimp and the fish with a tablespoon of olive oil. Sprinkle the seafood with the dry rub. Refrigerate the seafood until you are ready to cook it. Into a 12-14 inch shallow sauce pan, add the bacon strips and a tablespoon of olive oil. Cook on low heat until the bacon becomes crispy on both sides. Remove the bacon to a plate lined with a paper towel. Retain the pan bacon drippings. Once the bacon has cooled, cut it up into small pieces. Into the pan drippings, add the shallot, the garlic, the sea salt, and the ground black pepper. Cook on medium heat while stirring frequently for two minutes. Add the white wine. Scrape the bottom of the pan with a wooden spoon to loosen the bacon bits that have accumulated. Cook the wine with the shallot and the garlic for four minutes. Add the rice. Stir the rice so that all of the grains get coated with the wine, the shallot, and the garlic. Add four ladles of the warm stock and begin to stir the rice mixture. When the rice absorbs the four ladles of the stock, add two more ladles of it. Continue to stir. When the rice absorbs the two ladles that were just added, add two more ladles of stock while stirring. Continue this process adding two ladles of stock at a time while continuing to stir for 25 minutes. Taste the rice after 25 minutes for doneness. The rice is cooked when it is al dente (tender but still firm to the bite) and the mixture is creamy. If the rice is cooked turn off the heat. If not, continue adding more stock (a ladle at a time) while stirring until the rice is al dente and the mixture is creamy. Taste and add more sea salt and/or black pepper, if desired. Grill the seafood on a hot gas or charcoal grill for about six minutes on each side. The shrimp will turn pink once they are cooked and the fish should be firm to the touch. To finish the dish, add the peas to the cooked risotto and stir well. Add the butter and stir until the butter has melted into the risotto completely. Finally, add the bacon bits, the parsley, the basil, the chives, and the lemon zest and stir one more time. 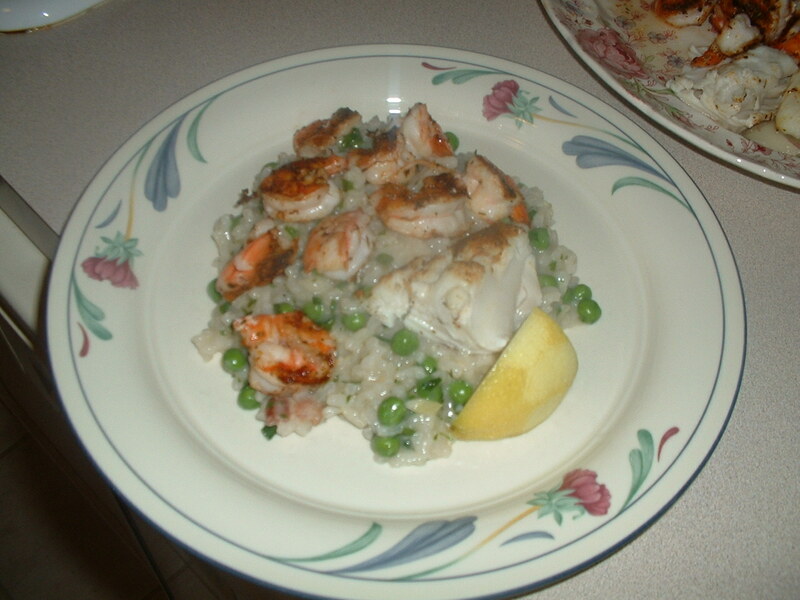 Serve the seafood on top of the risotto family style. Garnish with lemon wedges. Cut the broccoli florets off of the stems. The florets should be bite sized. Chop the stems into about 1/2 inch cubes. Add about 1/2 inch of cold water to a shallow pan. Add the cubed broccoli stem pieces and a teaspoon of sea salt to the pan. Put the pan on high heat and cook the stem pieces until they are soft. Add the florets. Cover the pan and steam the florets for 4 minutes. Drain the broccoli well in a colander. Place the pizza shells in the aluminum pizza pans. Brush the tops of the pizza crusts evenly with the olive oil. Sprinkle the tops equally with a teaspoon of sea salt and 1/2 teaspoon of crushed red pepper flakes. Add an equal amount of the basil and the garlic to each pizza. Place an equal amount of the red peppers and the broccoli to each pizza. Add the same amount of both the provolone and the mozzarella cheeses to each pizza. Sprinkle the top of the cheese uniformly with the ground black pepper. Bake in the preheated oven for 15 minutes or until the cheese becomes bubbly and slightly brown. Let the pizza sit for at least ten minutes before cutting it into slices.